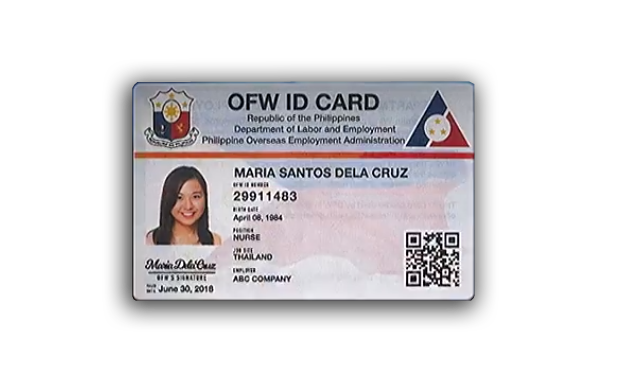 The new OFW ID card also known as the iDOLE was launched by the Department of Labor and Employment (DOLE) on July 12, 2017. In coming up with the card, the agency partnered with the Social Security System (SSS), the Development Bank of the Philippines (DBP), the Philippine Postal Corporation (PhilPost), and other government agencies and departments. All overseas Filipino workers can avail of the ID card for free. You don't have to pay anything to get the card. The new system will likely replace the Overseas Employment Certificate (OEC). Note 1: If you are already an OFW, you don't have to register and apply for the card. According to DOLE Secretary Silvestre Bello III, as long as you legally processed all your documents through POEA, your OFW ID will be processed and given to you. This is because your name is already in the official roster of OFWs. In short, you can only avail of the card if you have been legally processed for deployment abroad. Note 2: If you are an inactive OFW, you can still avail of the card. But you must submit your old record of employment abroad when you apply for the card. Note 3: As of this time, no IDs will be distributed because DOLE is still finalizing the guidelines on the implementation of the program. The agency will be announcing the proper procedure soon. 2. Go to the nearest DOLE office near you to inquire. Don't forget to bring identification documents with you. If you are an inactive OFW, bring your old record of employment abroad. Also bring your Overseas Employment Certificate with you. 3. Follow the processing steps as provided by the officer in charge. 4. If the processing is complete, you just have to wait for the card to be delivered to your home address by PhilPost. 1. If you are a Filipino migrant worker, processing of your documents will be a lot faster. 2. The card serves as proof that all the documents you have were legally processed through the POEA. 3. The card will serve as your travel exit clearance and it has a validity of up to two (2) years. 4. With the card, you don't have to pay for travel tax and terminal fee. 5. The card can be used for transactions with the SSS, Pag-ibig Fund, and the Philippine Health Insurance Corporation (PhilHealth). 6. Talks are currently ongoing between DOLE and the Department of Foreign Affairs (DFA) to allow OFWs to use the card in lieu of their passports. How Much Does The OFW ID cost? It's free. You don't have to pay anything. According to DOLE, the cost will be shouldered by your employer. The agency added that employers will be mandated to provide their employees with the ID card. What About OFWs Who Are Currently Living Outside The Philippines? For workers who are already outside of the country, an online application will be available soon according to DOLE. The cards will be printed locally. For example, if you are in the United States, you can apply online but the card will be printed in the Philippines.